The Engineering and Physical Science Research Council (EPSRC) has awarded a prestigious Programme Grant to a team of researchers from The University of Manchester, The University of Oxford, Imperial College London, and the Culham Centre for Fusion Energy. 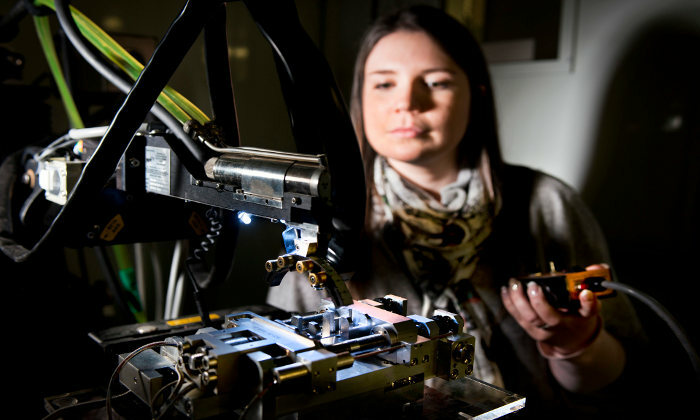 Aiming for nothing less than gold, the programme is known as ‘MIDAS’, which stands for Mechanistic Understanding of Irradiation Damage in Fuel Assemblies. MIDAS benefits from a unique set of industrially relevant materials irradiated in a research reactor to very high fluence levels, which were contributed to the research team by Westinghouse and the international Nuclear Fuel Industry Research (NFIR) programme. Due to their unique nature these samples have significant worth, which, alongside the EPSRC funding and industrial commitments, bring the total value of the programme to around £25 million. The assembly materials to be studied are used as protective cladding for the highly radioactive fuel used in a nuclear reactor. Due to the need to operate reactors as safely as possible, fuel is often removed well before it is spent because not enough is currently known about these materials, so plant operators must adopt a highly cautious, safety-first approach. This reduces the cost-efficiency of nuclear power as an energy option, as well as meaning that the fuel assembly prematurely becomes additional waste, which must be safely handled and stored over the long term. Gaining greater understanding of the performance and behavioural properties of these materials in the extreme environment of a reactor core will enable better, more efficient use of nuclear fuel, providing routes to cleaner, cheaper and safer nuclear power. Reactor safety, however, remains paramount, so MIDAS will also have a dedicated work package on better understanding fuel cladding behaviour in accident scenarios. The aim of this will be to ensure that reactors remain safe in the event of an incident such as Fukushima, and will include further work on the development of accident-tolerant fuels. A further key theme of MIDAS will be to explore the use of zirconium alloys in critical components for future fusion reactors. The UK has a leading position in defining the materials that will be chosen for the ITER and DEMO international fusion projects, and this theme will contribute to maintaining the UK's reputation as a centre of excellence in fusion research. Central to the programme will be the use of UK facilities at which work on active samples may be undertaken. These include National Nuclear User Facility sites at the National Nuclear Laboratory, Materials Research Facility, and the University of Manchester’s Dalton Cumbrian Facility, as well as new capabilities made available through the Henry Royce Institute. These have received significant investment from the UK Government, and MIDAS will be both a key beneficiary of this, and a trailblazing project to showcase what research is possible at these new and enhanced facilities. The ultimate goal of MIDAS is to help the UK, and other countries, meet carbon reduction targets, and achieve an energy mix that produces less CO2. The MIDAS team will work closely with a range of UK and international industrial partners in addressing this challenge and translate fundamental research into real-world impact.